During the Christmas holidays I had vowed to take it easy with the knitting. Just because the Mister was on vacation and therefore home 24/7 for over a week, didn't mean I should be knitting 24/7...even though I wanted to. The Christmas before I totally took advantage of the Mister's time off and my hands paid a deep, deep price for it. Not this time. This time I not only remembered to stretch my hands and arms but I also took a few days off here and there. Yes, I said days. Taking time off from knitting wasn't as bad as I thought it would be, since I knew it was for the greater good. In those off days I was able to do a fair bit of holiday baking, played game after game of Battleship, spent hours having Lego Ninjago Spinjitzu "battles", and even tackled the never-ending pile of laundry to the point where I finally got to see what the bottom of the basket looked like again! I picked up the knitting needles again the day before Christmas, when I was actually putting away the folded laundry into the dresser (because we all know there are stages of laundry...the dirty to-be-washed pile, the clean but not folded pile, and the folded but still needs to be put away pile) and I spied one of my sock WIPs buried under a pile of papers on my nightstand. Without even thinking I sat down on the edge of my bed and started knitting. The Mister and Kiddo noticed (eventually) that I was gone for a good chunk of time, and in that time I managed to whip up a few inches on that sock. I blame it on that whole "just one more stripe" talk that you constantly say to yourself when you're knitting with self-striping yarn. Or maybe that's just me? Anyhoo, I decided that I should just finish the pair because who wouldn't like to start a new year with less WIPs on the needles and the opportunity to start new projects in the new year? I reasoned this was going to be an easy feat since the first sock and half of the second sock was already completed. So I worked on the sock throughout the day while the Christmas turkey was in the oven and the Mister took over the kitchen to cook the rest of the feast (he's very particular with certain dishes and he wasn't up for playing Super Mario Bros with the Kiddo). I had cast on these socks back in September but took a breather from them after whipping up the first sock so quickly. As weird as it sounds, even though I couldn't wait to wear these socks, a part of me didn't want the project to end. I had thoroughly enjoyed working with the yarn and watching the stripes build up so much that it felt very therapeutic to knit on this project. And the colours...I mean, just look at the colours!! What's not to love? As per my MO when it comes to self-striping yarn I cast on this pair toe-up so that I could get the most out of the skein. I was originally going to knit this as a straight up plain vanilla sock but after knitting up the toe on the first sock I decided to throw in right and left leaning two-stitch "mini cables" as a way to break up the monotony of all that stockinette. After all, at the time that I had cast on this pair I also had two other plain vanilla socks on the needles. At first I had a game plan as to how I was going to place the twisted stitches but it didn't really go the way I had seen the idea in my head. I didn't bother to rip out the sock though, I thought it still looked cool (this was the sock on the left foot, pictured above). The second sock I played around more and while it still wasn't what I was going for, I still liked the outcome. 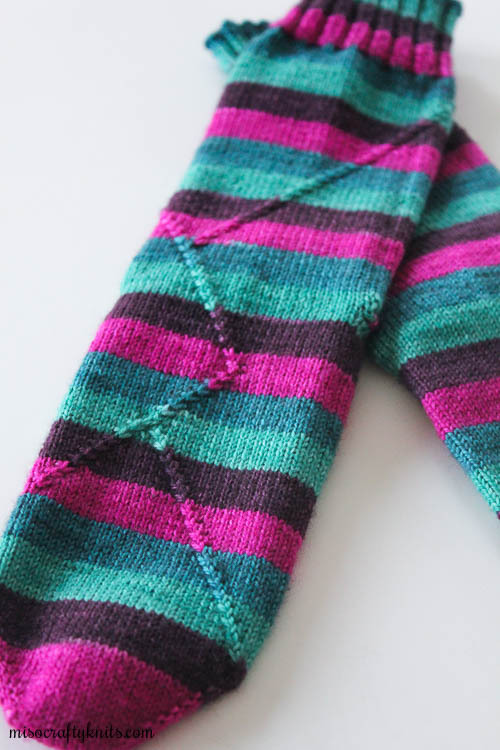 Totally unplanned but what worked out in the end and has become my favourite detail, was the meeting of the mini cables at the start of the cuff on one of the socks (pictured above). Sadly I didn't keep any specific notes about what I did, other than how long I had knit the foot, leg, and cuff, and the fact that I had only a couple of stripes leftover in the yarn once I had knit in the afterthought heels. I doubt I'll knit another attempt at this design idea but I won't shelf it completely. The mini cables are fun to knit and don't require the use of a cable needle, so I wouldn't mind playing around with this idea again. Yet the chances of me actually doing so are quite slim. I'm not sure if my brain is done with the idea and I just can't seem to justify knitting swatches for a sock when to me, the sock is the swatch. I guess I'll just have to wait and see...after all, I do have a fair amount of self-striping sock yarn in the stash and will most likely want to switch things up from the straight up plain vanilla from time to time. I've been asked several times now how I get such clean and crisp stripes in my ribbing. Meaning, how do I avoid those annoying "purl bumps" when transitioning from one colour to the next? I don't know what other knitters do, but what I do is super easy: the second the yarn changes colour I simply switch from ribbing to knitting all the stitches in knit stitch until I reach that first stitch in the new colour. No purling. And regardless of where I am in the round. Once I reach that first stitch (and I usually have to knit a full round to get there), I switch back to the ribbing pattern. This always yields great looking results and in my opinion, doesn't change the fit or stretchiness of the ribbing. At least, I've never noticed or felt a difference. And that knit row blends in perfectly. You won't even know it's in there unless you're searching for it. I use this technique on all my stripe-y socks. I should note though, that this technique won't work on single round or even two round stripes. The former for obvious reasons; and the latter because you'll jeopardize the integrity of the ribbing, since you would be alternating a knit row with a rib row. Anyways, back to the socks. I love how they turned out and I honestly can't say enough good things about the yarn - which is dyed by my dear friend, Chantel of Mudpunch. I love her eye for colour and really appreciate the attention and care she puts into each and every single skein she dyes. This is my first time knitting a pair of socks using her yarn and I'm pretty darn sure it won't be the last! 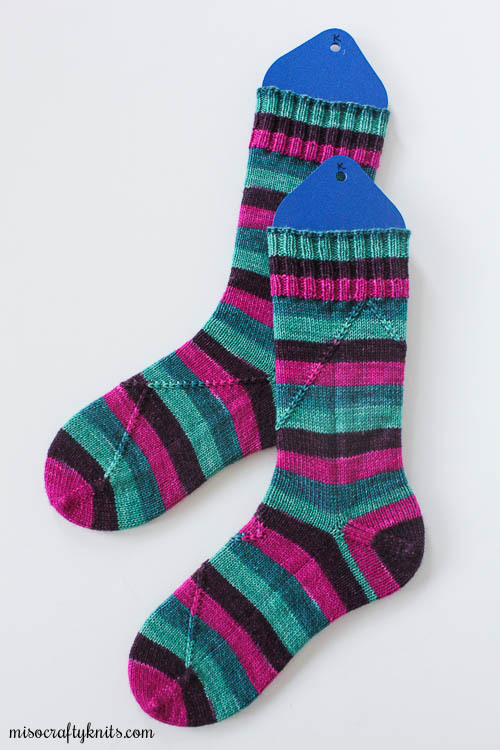 ooh, those socks are stunning, I can see how a stripes in that colourway would be so addictive! I haven't tried out Mudpunch yarns yet, but I follow her on instagram and have swooned many times. I love the pattern you chose, too! Doesn't compete with the yarn at all. I learned that too, to knit the new color so the striping comes out clean in the transition. I love these colors. Your socks look amazing and I very muchly appreciate your kind words about my yarn. Oh I love them! 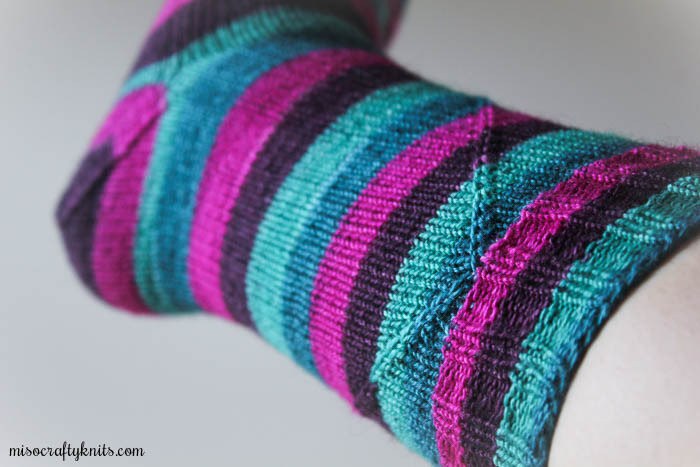 I adore that traveling cable, it's so cool and doesn't distract from the awesome striping at all.